You are here: Home / Christian Talk / SURGE: How the Church is Empowering Black Men to Achieve. (ThyBlackMan.com) Not all news about black men is negative. For decades now, we’ve heard negative news coverage, data, conclusions drawn by social scientists and even some in our own community that the black man in America is dangerous, deviant and dysfunctional. The media will peddle surface views to the masses – one must be willing to research and work to uncover the truth. New data, for instance, shows that black men are – and have been for quite some time – moving into the mainstream like never before. The truth is black men are surging forward and upward; more black men are poised to enter the middle class than ever before; plying new roads in finance, authorship, entrepreneurship, family, faith and fitness. According to Black Men Making it In America: The Engines of Economic Success for Black Men in America by W. Bradford Wilcox, Wendy R. Wang, and Ronald B. Mincy, there are three principle engines driving this surge of new prosperity and achievement by black men: the U.S. military, the black church and the institution of marriage. Although all three play major roles, it is the black church that interests me the most, in particular the role the church plays in preventing young men from contact with the American criminal justice system. The authors of the report write: Black men who frequently attended church or other religious services at a young age are also more likely to reach the middle class or higher when they are in their fifties: 53% of those men who attended church as young men made it, compared to 43% who did not. The authors’ further state that the most likely reason for this phenomenon is that churchgoing may lift black men’s income by reinforcing prosocial behavior. Churchgoing is also linked to greater odds that black men reach the middle-class or higher-income brackets in midlife. Research also suggests that churchgoing reduces the odds that black men have contact with the criminal justice system and increases the odds that they are employed or in school. This is great news and reinforces the view that exposing young black boys to church at an early age is an effective deterrent to a life of crime. Does it mean that all boys who attend church never come into contact with the criminal justice system? Of course not. It just says that young black churchgoing boys are less likely to be exposed than are. It’s more than just Bible study, prayer and Sunday school – it’s also discipline, character-building and social skills that the church offers. Whatever we suggest that the church is not, we cannot argue with the fact that organized religion on some level instills young men with, as the sociologist Elijah Anderson terms it, a “code of decency” that encompasses personal responsibility, gainful employment and a “positive view of the future”. There are many black churches that offer some form of ministry for men and include mentoring programs for the black boy demographic specifically. Do we need more? Indeed we do! It is important that we recognize this forward and upward mobility of black men in America and continue to create and foster the environment that will keep our men on the road to achieving great things. 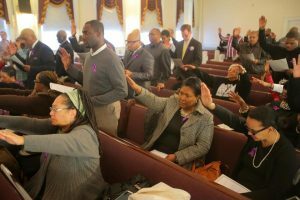 Black men are surging forward and the church is at the forefront of that effort. @PelvoWhiteJr. : Less opinions. More solutions. Eric: It has been my observation that too many so-called preachers are nothing more than lazy men, and women looking for an easy buck from poor, and misguided African Americans by half-hardheartedly using the bible to hoodwink them.Why don’t preachers stop trying to convince African Americans to be reformed Hebrews, and preach being good Americans ?It is my opinion that when white chattel slave owners got off of the backs of freed slaves, the African American preacher got on, and has been riding the deceived African American ever since. America is a democracy, not a theocracy. @Pelvo White, Jr.: It was not my examples I cited, it was from the report mentioned. Try reading that report and maybe you will come to different conclusions than lambasting preachers. I hired a man to lay some new carpet in my house. The white man , and his son did a very good job, and while he was working he talked with me. I asked him how he came to be in the carpeting business ? He said that his church helped him go into business. He told me that his church loaned him the money to buy his van, and, the tools he needed to do his work.He also said that members of his church supported him by being some of his first, and continuing customers. I don’t know one single black preacher that can complete his own IRS 1040 Form and accompanying schedules let alone conceptualize a church owned credit union or bank.Any career that has at its core the possibility of being killed by a bomb,bullet or disease like that of the military isn’t a very good career, and finally,arguments over finances is one of the major causes of divorce in America today.Your examples of empowerment are weak.